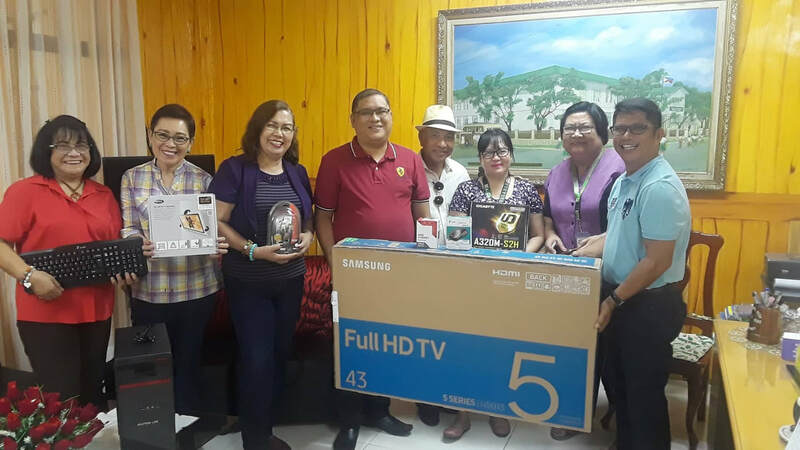 Today, Mar 7, CAHSAFI turned over the latest donation to Journalism: a desktop PC, a 43" TV that can double up as a pc monitor, with wall bracket and a 9' HDMI cable. 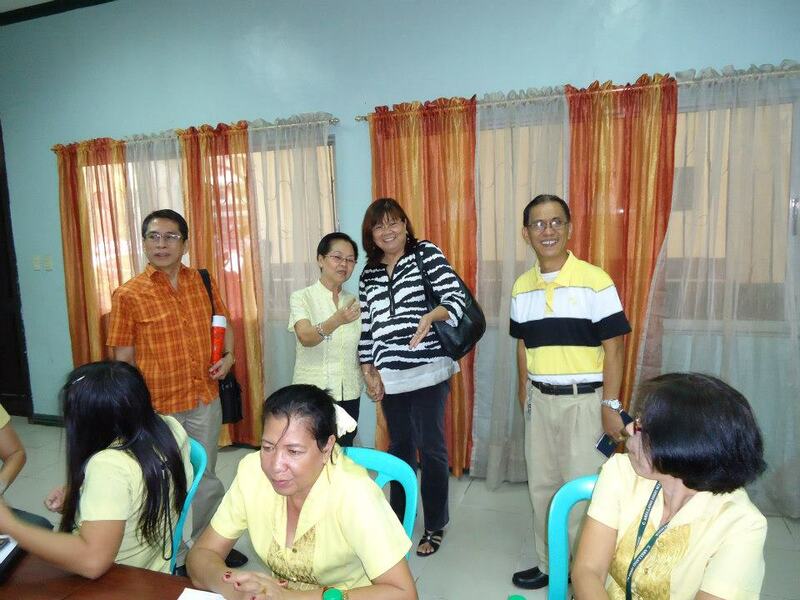 The principal, Mr Talattad was at a conference outside of school and was represented by the OIC and Ryan Cadiz. This completes CAHSAFI Journalism Committee's donation to the Chronicler staff - Cecille Dominguez's wish list. Much thanks to @Linda Lim-ang (@Evelyn Tabora Tiamson & Jesse) for the legwork and @Robbie Sid for his support as well as all the Committee's approval. Cecille won't have to borrow equipment anymore for her presentation and publishing work. 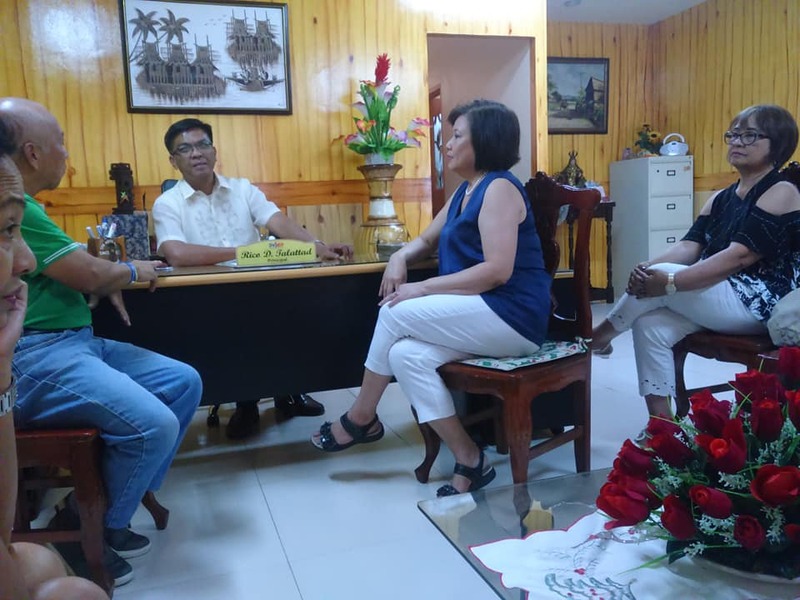 AHS last Feb 21, 2019, to pay the new Principal, Mr Rico Talattad, a courtesy call to express continuing partnership with the school and its student organizations. 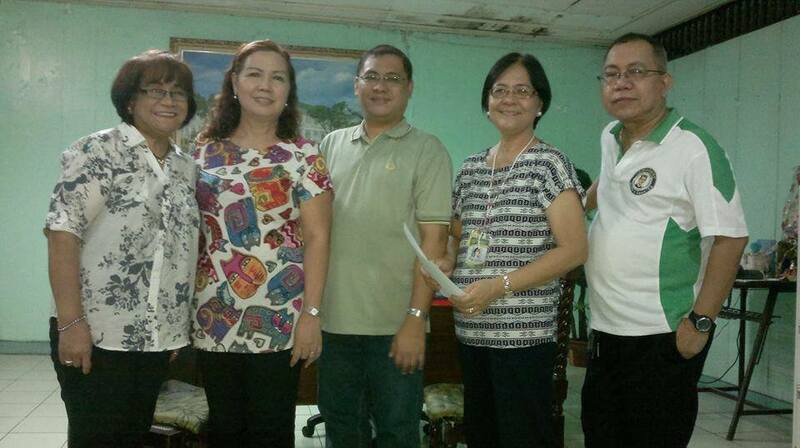 They also visited the Chronicler staff room to discuss with its adviser, Ms Cecille Dominguez, our commitment to continue supporting the Journalism Dept. 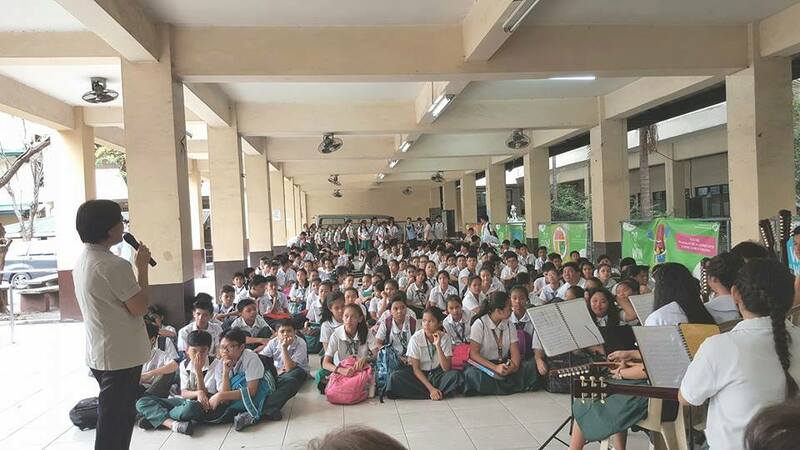 They were also entertained with music from the school rondalla under the baton of Leah Santos. 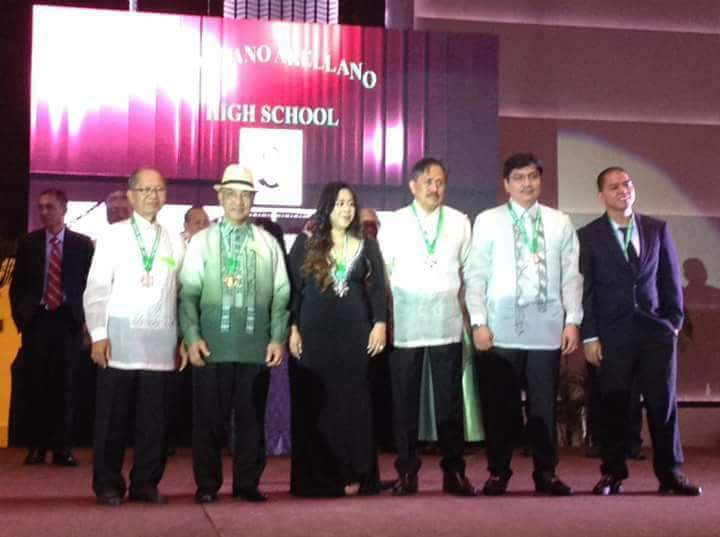 The Principal was also a guest speaker at the recently-concluded 74th General Homecoming held at the Manila Hotel's Tent City last Feb 16, 2019. ​Pictured below are the newly-painted statue of Cayetano Arellano and the ongoing construction of the roof over the quadrangle. I'm so sorry to tell you about the heartbreaking news that one of our CAHSAFI founding Directors, Sesinando Nocasa Cantor, have passed away last night at 9pm, March 14, 2018 due to health complications. 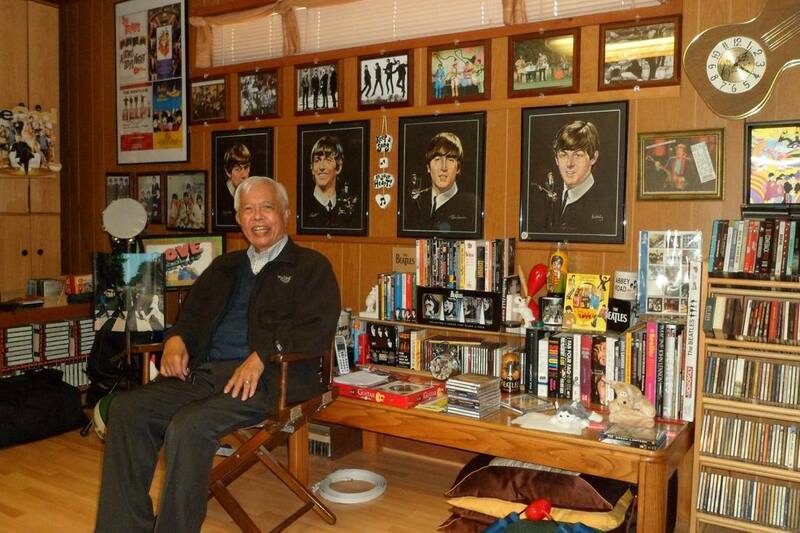 His wife, Lourdes (Lulu), called us this morning to tell us of this sad news. He had been so instrumental in drafting our Articles of Incorporation and our Bylaws. At the time of his death, he was our Chairman of the Scholarship Committee. He was also very instrumental in advising Evelyn re our books, and me about legal matters. His dedication to our mission and passion for our charity, especially our scholars, is unquestionable and he was always ready for advice whenever Evelyn and I had some doubts and questions re policies, legal, and accounting issues. 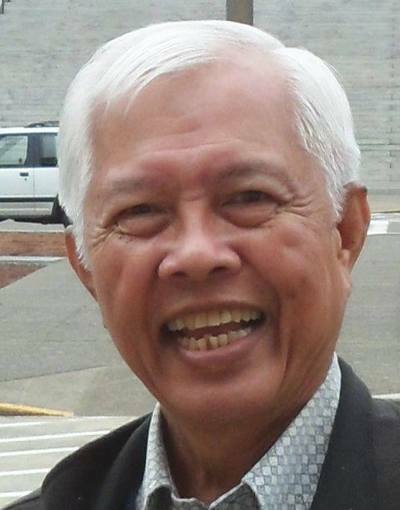 Besides our charity org, he had been active in the greater Seattle area organizations, a founding member of the Fil-Am Assn of CPA of Seattle (FAACPA), the Int'l Drop-in Center (IDIC) in Seattle, Fil-Am Community of Renton (FILAMCOR), and many parish organizations of St Anthony Church. He is survived by his wife of 52 years, 3 sons, 1 daughter, and 9 grandchildren. He would have been 80 this July 16, 2018. Below are some photos of him with us and his family. We will surely miss him! Rest in peace, dear good friend! Say hello to our dear friend Emilio Rubio Ruidera when you meet him in heaven! Class 1968 successfully reached and celebrated its 50th anniversary February 17, 2018 at the Manila Hotel. Cahsafi Chairman and President Jesse JT Tiamson was awarded the Most Outstanding Jubilarian. Among those honored was Cahsafi Director Tony Lacanilao. "To feel much for others and little for ourselves, to restrain our selfishness and exercise our benevolent affections, constitute the perfection of human nature.” (quote from Adam Smith, Scottish philosopher and economist from the 17th century). This is the reason you see some of the current AHS students in front of you. They are some of the best that our Alma Mater has to offer. 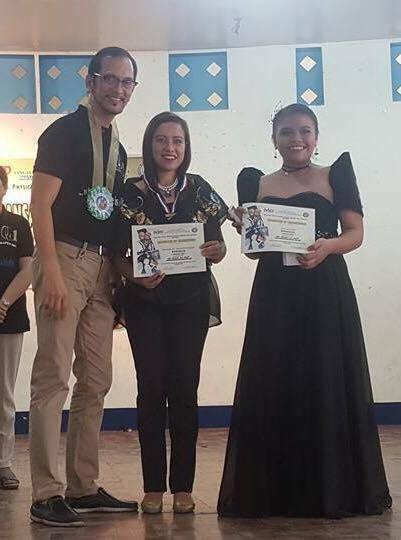 With the able tutorship and guidance of their conductor, Leah Olmos-Santos, they have, time and again, won every competition they entered in and have represented our school last year for only the 2nd time at NAMCYA, the National Music Competition for Young Artists against the best rondallas in the nation. This is why CAHSAFI exists, the culmination of the dreams of the CAHSAFI Directors, many of whom are here. Look at the inside front cover of your souvenir magazines and you will see that they are your classmates in high school. 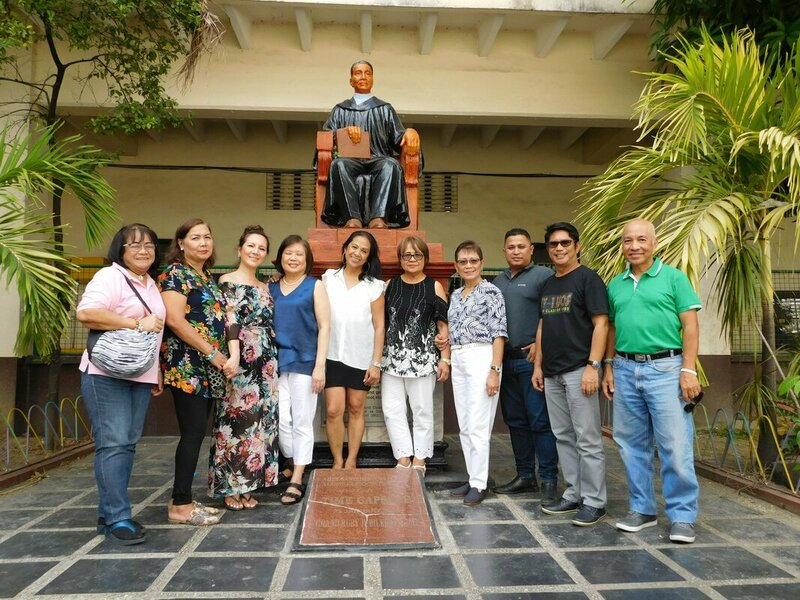 My dream and that of my co-founder and very good friend from Class 1971, the late Dr Emilio Rubio Ruidera, represented today by his oldest sister, Arceli Ruidera Antonis of Baler, and who came all the way here from California. If you want to help these talented students, help us help them with your donations to CAHSAFI. Your money is an investment well-spent. Equally, what gives me the greatest pride and contentment is attaining for our greatest generation – the veterans of WW2 – their long overdue recognition for valor and sacrifice in defense of our freedom and democracy. As a lifetime member of the Phil Scouts Heritage Society, the Phil division of the US Army, we have worked with the US Congress to grant the Congressional Gold Medal to those Filipinos and Americans who fought valiantly in WW2 in the Philippines. My wife and three other ’68 classmates will receive these medals on behalf of their fathers when we go back to the US. Two other locally-based classmates will receive these for their fathers during the Fall of Bataan Day at Mt. Samat. I know that more of my classmates are equally deserving, if not more, to receive this award. But if the Alumni Association thought that I’m worth being given this award, then on behalf of all my Batch ’68 Golden classmates, I humbly accept this award, along with my good friend, Antonio Lacanilao , Jr, if just to inspire the young generation, like those who are here in our Rondalla, to pursue their dreams in the face of any obstacles. Remember that the best way to achieve success is by creating it yourself. 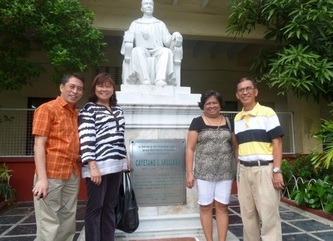 I want to thank the Alumni Association for continually hosting this annual gathering under the leadership of Mrs Beth Cristobal and Atty Rosauro Ocampo and current President Napoleon Salas, Jr; my wife, Evelyn, who had always been the wind beneath my wings; to Kuya Herman Gamboa who had always been my idol (Lodi in today’s street slang); and lastly to batchmates Elizabeth Halili Beano and Reynaldo Lanuza for their steadfast belief and support. 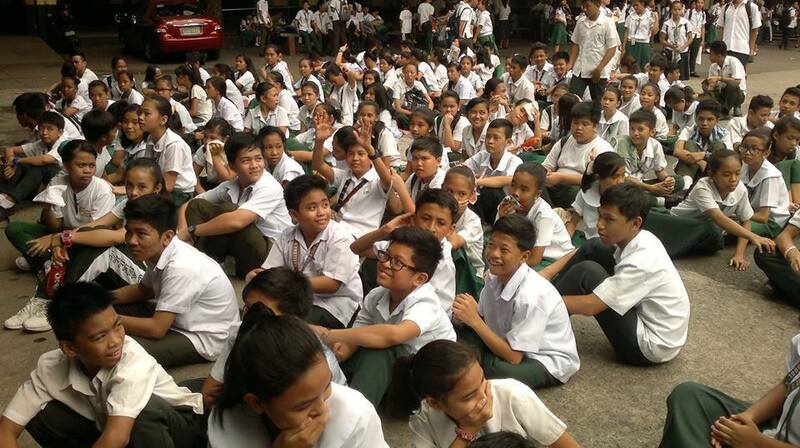 Arellano High will always be relevant yesterday, today, and tomorrow. Upang sila’y gawing sangkap sa paggawa nang magaling. At ang landas ng Lumikha’y panghiti mong taluntunin! Marami pong salamat at pagpalain nawa tayong lahat ng Poong Maykapal! ​It is with great pride and honor to let you know that our AHS Rondalla, led by its conductor, Leah Santos, has won the citywide Rondalla competition at the recently concluded TUGDUSAYAWIT (short for Tugtog-Dula-Sayaw-Awit) last March 2, 2017. 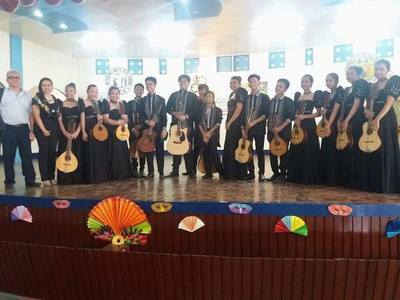 They bested other Sr High Rondalla. AHS is a junior high school. 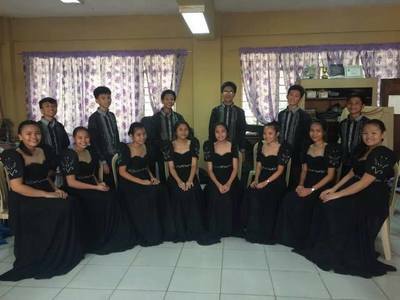 "We're so delighted to inform you that our Rondalla is still the CHAMPION in the division of Manila! Thank you for your support, CAHSAFI! Glory to God! 'Onward marching ever willing to fight for the green and white!' Our CAHS Rondalla is once again the Champion in the division of Manila! 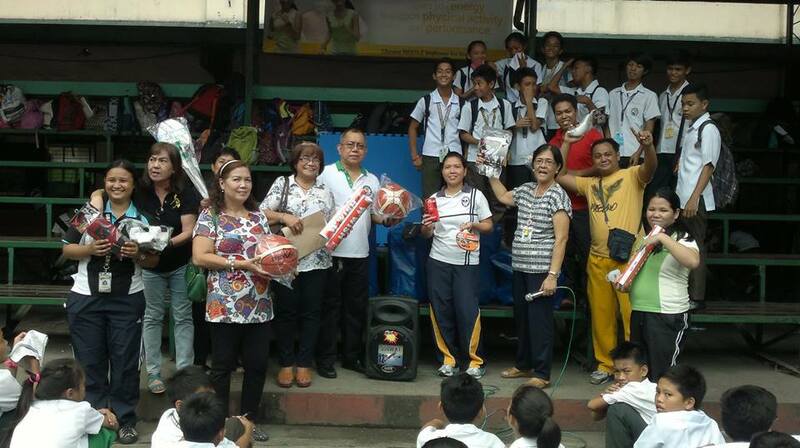 Thank you to CAHSAFI, our principal Dr. Loida D. Diaz, Our MAPEH Dept. Head Mrs. Carolina Manalaysay, Arellano teachers and parents who always support our Rondalla members. All glory to God!" 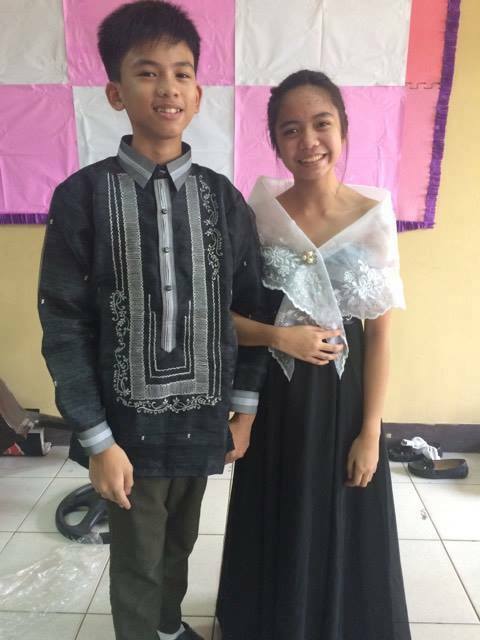 The following photos are from the competition (members in black gowns and Barongs).The other photos show them in green costumes and was taken at a different event where they were invited. They have also appeared in Luneta and on TV lately. 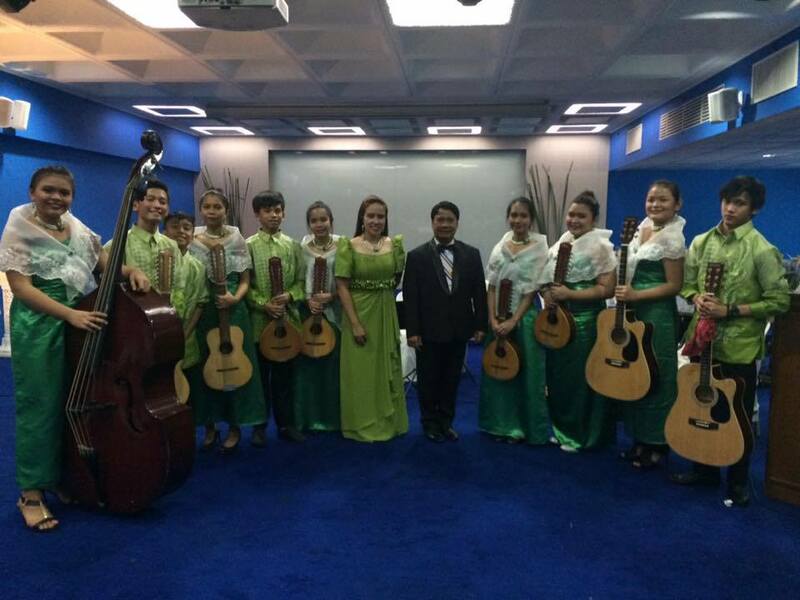 Received a message from Leah Santos, the rondalla adviser/conductor about their new Ternos and Barongs pictured here. We paid for half of this as part of the recent donations last Feb 21st. The other half was paid for by the honorarium they have saved from all their past performances. Sayang at hindi naihabol lahat for the event but one was worn during their performance. I will post this in the Public page so you can express your thanks and sentiments for Leah and ot...hers to see. Here's what Leah said: "Here's the new costumes of the rondalla. We chose color black this time to have an option, we thought black can be matched with other colors, especially for the alampay and tapete. The second picture is another style, we use a white alampay. We also have a yellow alampay to match the black gown." As part of our mission, CAHSAFI, in collaboration with 2017 Diamond Jubilarian Class 1957 (as part of their Homecoming gifts to our Alma Mater), donated multiple items to AHS Journalism, Rondalla, & MAPEH last Feb 21, 2017 in a turnover ceremony attended by alumni of Class '57 and CAHSAFI Directors from Manila, the US, and Canada. 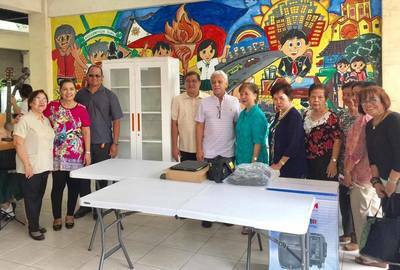 The donated items were received by the Principal Loida Diaz, MAPEH Head Carolina Manalaysay, Chronicler adviser, Malu Gubat, and Tambuli adviser Joselito Zacarias and witnessed by the students and other teachers. 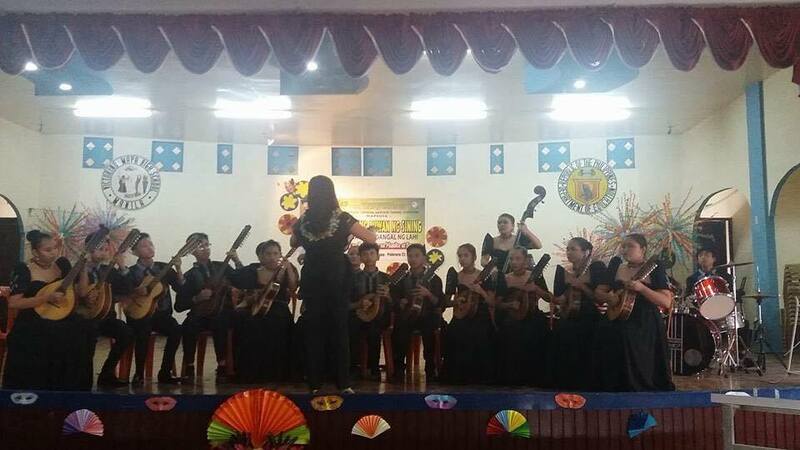 The group was also entertained by the much-awarded Rondalla group conducted by Leah Santos. We thank everyone involved in making all of these possible. 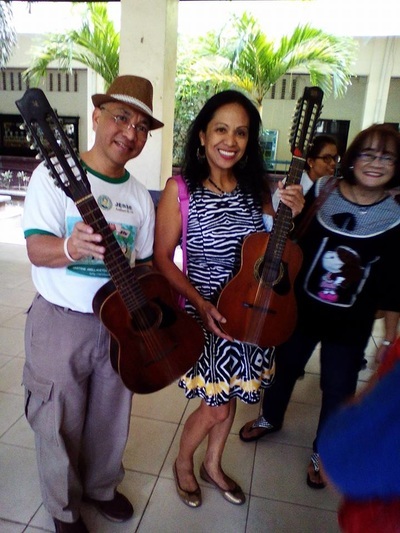 I just got a text of good news from Leah Santos, rondalla conductor, while we were on a tour in Legazpi, Bicol. Our rondalla won the championship for the whole of Manila just now, Feb 17! 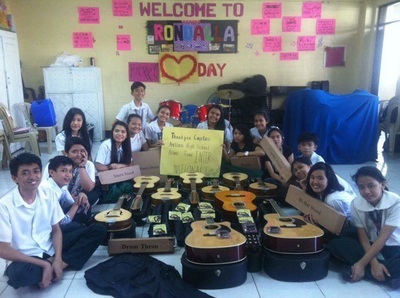 They added the 10 stringed instruments and a drum set we just donated last Jan 26 & Feb 12. What an accomplishment! They must have been inspired by our donations! 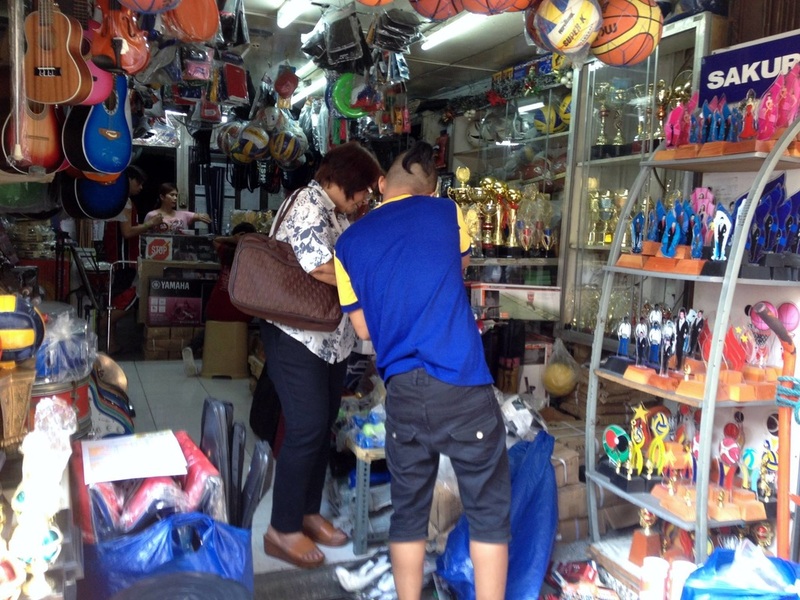 In keeping up with our Mission, CAHSAFI is pleased to announce its latest donation of sports equipment to AHS totaling over Php 44,000.00. The Sports and Athletics Funds (SAF) Committee, chaired by CAHSAFI Vice President, Victoria Manasan-Milan (class ’70), with the help of its Manila Liaison, Jocelyn Jarlos-Sosa (class ’70), and Phil Director German Gapac (class ’73), turned over to Mrs Carolina Manalaysay, Head Teacher of MAPEH, all the equipment in a short ceremony an...d witnessed by the students last Sept 4, 2015. It was a timely deed as the school athletes were competing in a city-wide athletic meet at the time. On behalf of the Board of Directors, I would like to thank the members of the SAF Committee and all the donors, especially the Class of 1955, on making this latest donation possible. We enjoin everyone to continue helping us be the conduit to helping our students get a chance at life and to bring honor to the school by sharing the blessings we have received from the Lord’s bounty. 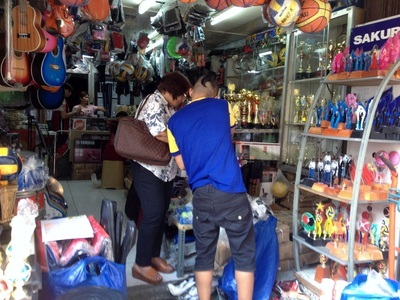 Foto 1 shows Jocelyn purchasing the equipment from the Sports store. Foto 5 at the successful completion of the turnover, CAHSAFI treated them to a well-deserved lunch! 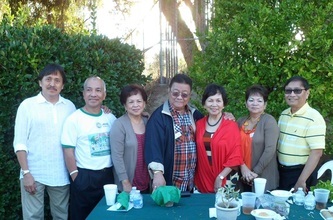 Special thanks to Linda Lim-Ang (class '73) for sharing her photos of the event. 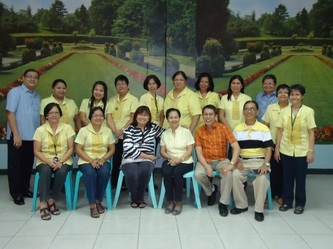 President Jesse D. Tiamson called a meeting of new directors February 14, 2015 at Mabuhay Manor, Malate, Manila, Philippines. It was an opportunity to meet the new scholars. L to R front:MaryJoy Billante, CAHSAFI Scholar, PLM; MJ's mother; Arcie Fan Ferrancullo, KPMG-Class '64 scholar, PLM; Arcie's Mom; Gabrielle Karl delos Santos, Class '71 Scholar, UP Los Baños, Karl's Mom. L to R back:Marissa Velasco-Wenceslao (Manila), Virginia Liwanag-Sta Ana (Manila). 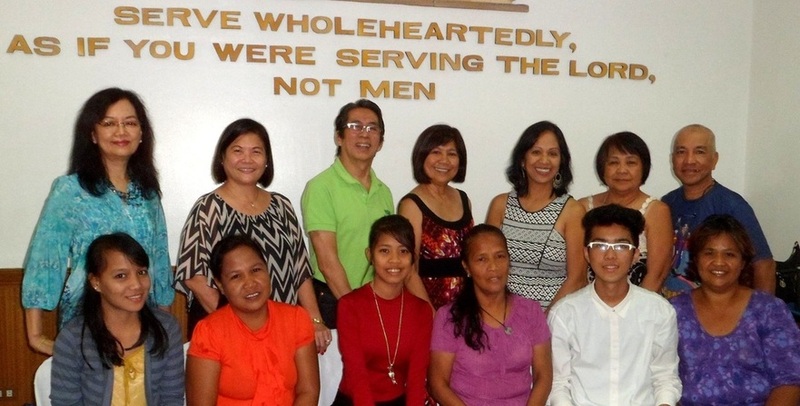 Ysrael Cunanan (ex-Director, Manila), Dinah Aquino-Paner (California), Imelda Lapitan-Fleming (California), Evelyn Tabora-Tiamson (Washington), Jesse D. Tiamson (Washington). Congratulations to the 2014 CAHSAFI Scholars and Awardees! CAHSAFI COLLEGE Scholar - May Joy Billante Winner of the ₱30,000/semester Grant. Enrolled at Pamantasan ng Lunsod ng Maynila (PLM), BS Education. Class '64/KPMG Scholar - Arcie Ferrancullo Winner of the $50/month stipend. Enrolled at Pamantasan ng Lunsod ng Maynila, BSBA to major in Accounting. 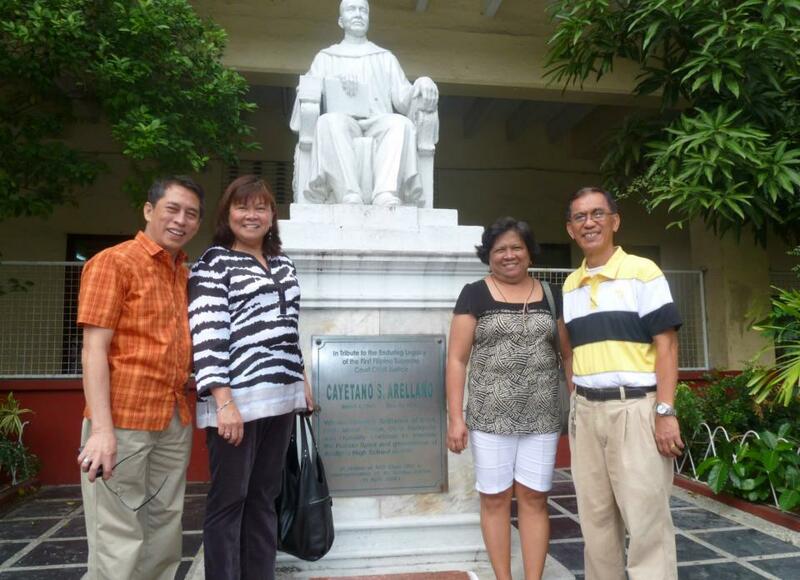 Class '71 Scholarship Grant Awardee - Karl Gabrielle delos Santos One time award of ₱30,000 . Enrolled at University of the Philippines - Los Baños BS Math and Science. Also the winner of the school's Juan dela Cruz Award. CAHSAFI-CAHSA Grant Awardee - Lemuel Abron Sponsored by the Hemmerich Family. Enrolled at University of the Philippines in Diliman, AA Fine Arts, now on his 2nd year of college. Portia Ericka Jaril - Class 2014 Valedictorian Enrolled at the University of the Philippines, BS Electrical Engineering. Also the winner of the school's Tandang Sora Award. Lester Estella - Class 2014 Salutatorian Enrolled at Pamantasan ng Lunsod ng Maynila, BS Physical Therapy. 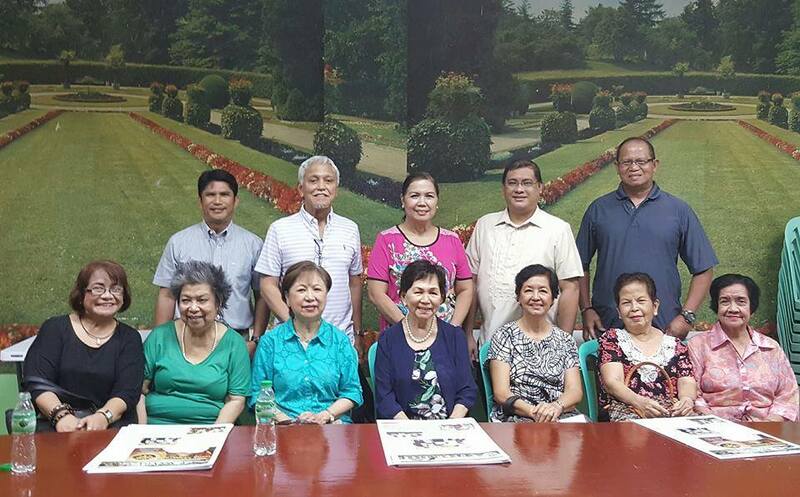 Day before the AHS USA Alumni Garden Party Reunion, ten out of the eighteen CAHSAFI directors gathered together to a fruitful meeting, brainstormed ways to gain support of every AHS alum and eventually make a difference in helping the Alma Mater and its students. CAHSAFI Board Members, L-R Front Row:Evelyn Tiamson, Dinah Paner '64, Mel Fleming '70, Anita S. Schon '55, Sylvia L.E. Hemmerich '71...Back Row:Jesse Tiamson, '68, Rey Paner, Roland Lacanilao '71, Percival Campoamor Cruz '64, Antonio Lacanilao '68, Sahlee Lacanilao '68, Emilio Rubio Ruidera '71. 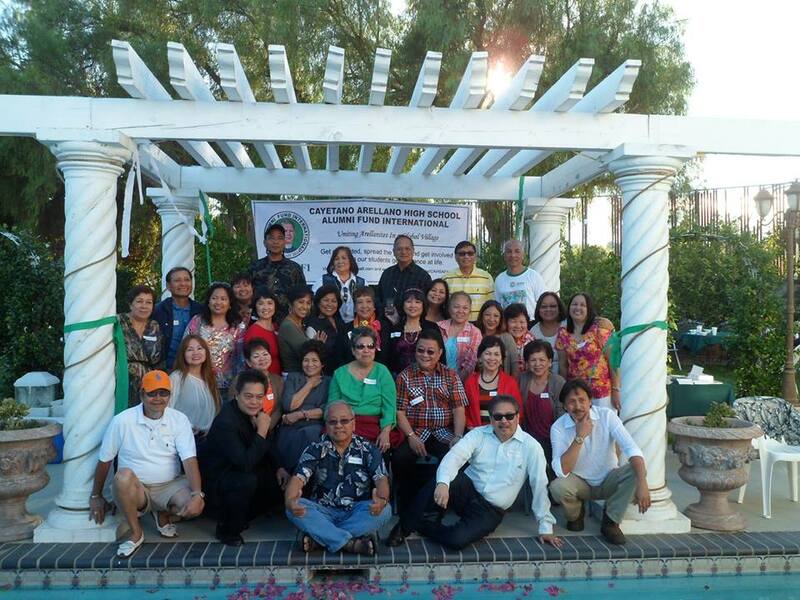 A mixed-batch reunion of U.S. based AHS Alumni was held in Granada Hills, Los Angeles, California September 21, 2013. This affair was organized and sponsored by Cahsafi. Participants came from all over the U.S. 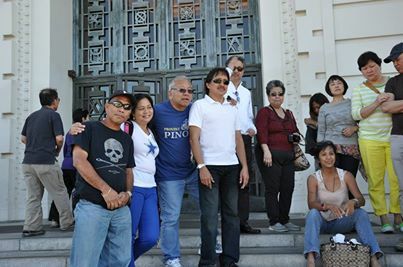 Couple Herman and Lita Gamboa flew in from the Philippines. A fund-raising auction raised money for Cahsafi's projects. 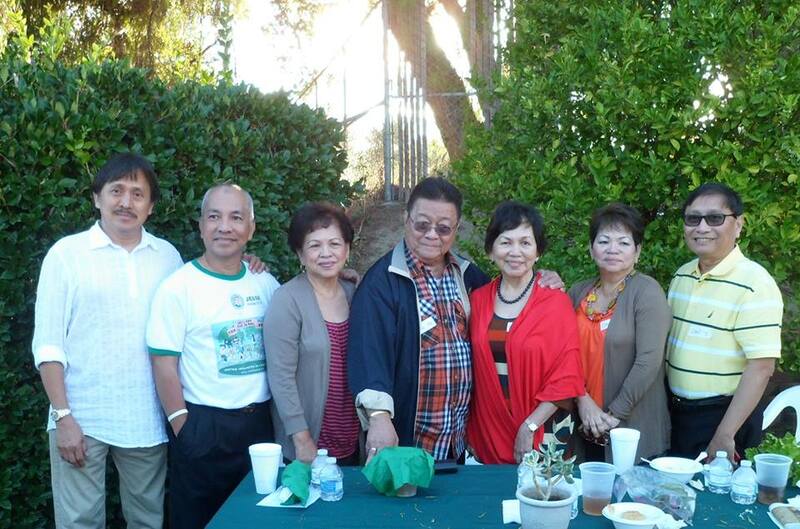 The garden party was hosted by Tony and Sahlee Lacanilao at their residence. 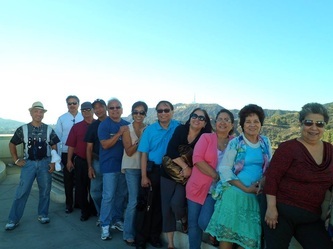 Day 2 was a tour of Hollywood Boulevard, L.A.'s China Town, and Griffith Park. This was posted by Director Sie on the Board FB. Here is a copy of the August letter by Lemuel Abron. He graduated early this year from AHS. He's currently enrolled at UP Fine Arts on a 2-yr certificate degree. Attached is the letter of introduction by Lemuel. It's a heart-warmer. 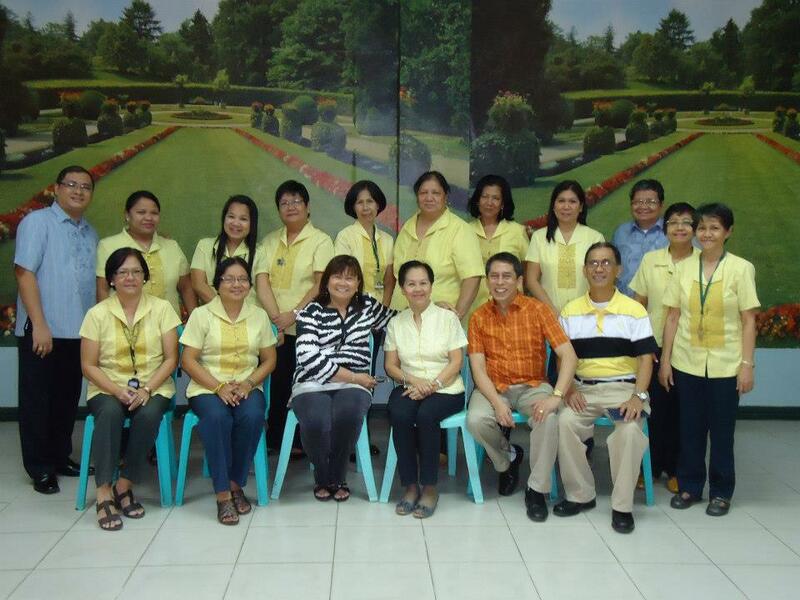 . .
enroll at the University of the Philippines in June, 2013. First of all, I would like to greet you a good day! Ma’am,I would like to say sorry if I am sending this letter late. I’m really, really sorry. I’m very happy and honored to be one of your scholars. I’m also glad to know that the persons who support me are Arellanites, too. It has been a great and big help for me and for my studies.Your support encourages me to pursue my dreams and persevere more in order to reach and turn my dreams and visions to reality. It also gives me the strength to remain hopeful and believe that no matter how difficult it seems, there will always be a light, like you, who will never stop helping and guiding persons like me. Also your help brings out confidence and serves as my motivation to strive harder. I should strive no matter what happens to be able to continue your legacy of generosity that someday, somehow I will also help others who are in need. No matter what happens you will always be a part of my life. I promise that I will do my best in my studies. I will give my 100% in everything. I’ll make sure that what you have given me will not be wasted. Again, Ma’am, THANK YOU SO MUCHfor the support you have given me. May your loving heart never stop loving others. God bless you Ma’am and your family. Arellano High School on January 7, 2013. She was accompanied by Board Members Israel Cunanan and Val Obana. She had the chance of meeting the department heads. 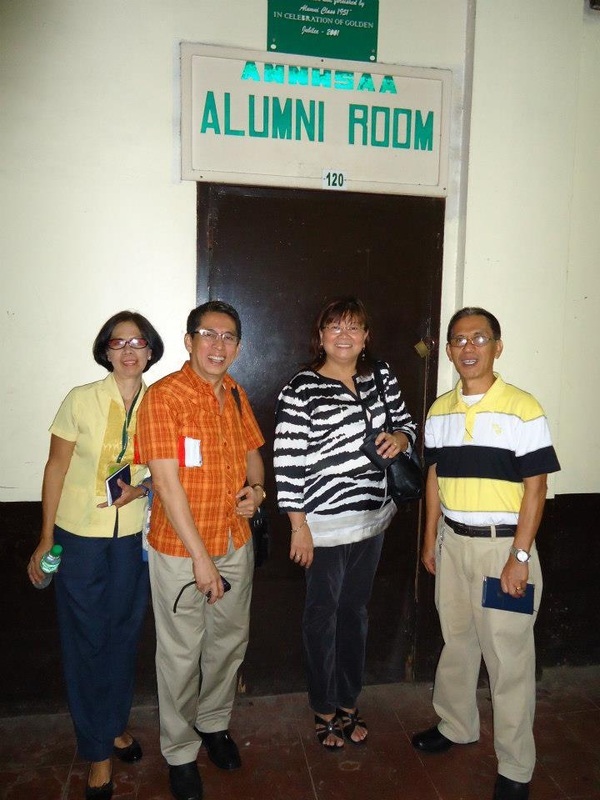 She was given a tour and she saw the physical improvements in the school, most notable of which, was the newly-opened Alumni Room. One of the best things that ever happened to the world is the miniaturization and commercialization of personal computers and the effectiveness of tools, say technology, that support the computers like the internet, wi-fi, the search engines, the discussion groups, the social media groups, Skype, and others. It is now so easy and so cheap to be connected with friends and relatives. How does this wonderful development benefit Arellano High School? There is currently an explosion of websites dedicated to and created by Arellano High School communities all over the world. At the forefront is www.cahsafi.com. This is the communication vehicle of Arellano alumni overseas. 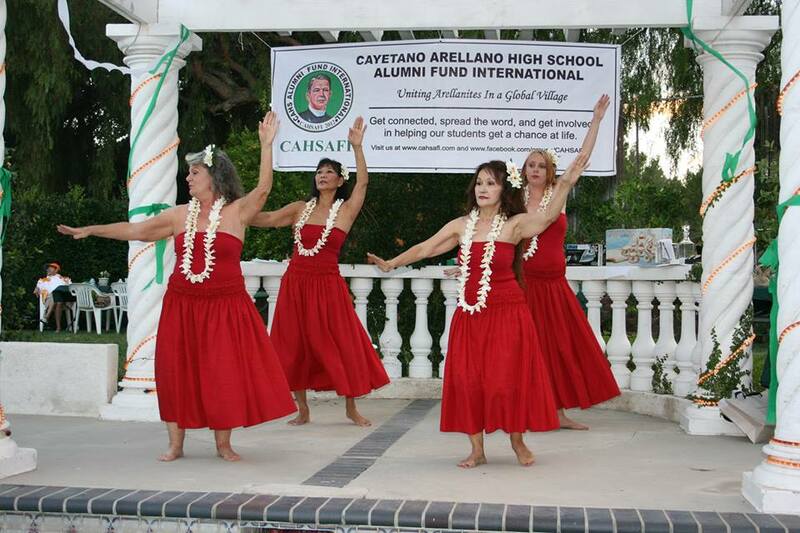 These alumni overseas organized and incorporated a non-profit corporation named Cayetano Arellano High School Alumni Fund International (CAHSAFI). 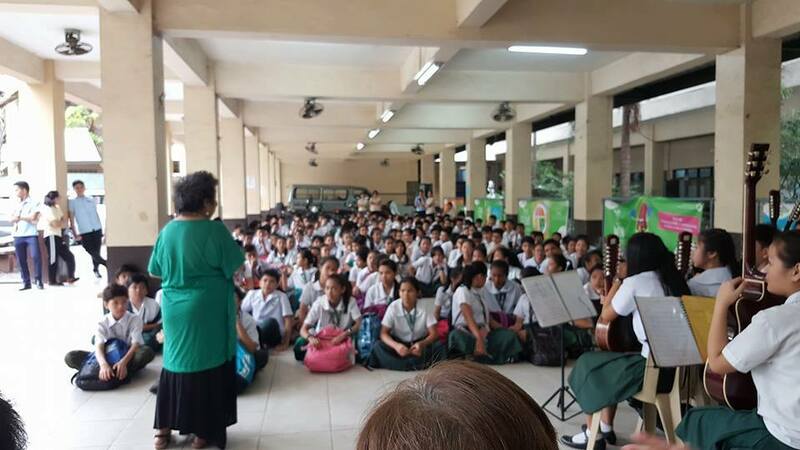 Its main goal is to provide financial support to qualified and deserving scholarship, music enrichment, and journalism programs of the Alma Mater. CAHSAFI was organized in July, 2012 at Las Vegas, Nevada, U.S.A. A good number of alumni travelled from different parts of the U.S. to be part of the organization’s launching. CAHSAFI’s statement of principles allude to the formation of a global village of Arellanites who are able and willing to give a hand so that current and future students can have a chance at life. Most alumni struggled in high school due to adversities in life. Perseverance and education gave these alumni the breaks. Now that they are in a position to help, they want to support the school programs, as a matter of paying back gratitude. Students, school officials, and alumni can interact with CAHSAFI online by visiting the said website, www.cahsafi.com. The website features a page where contributors can use their credit cards when they want to send donations in support of the aforementioned programs. There is also a CAHSAFI Facebook Page that now hosts the communication exchanges of some 500 Arellanites all over the world. www.arellanohigh.com is a website commonly used by all the different class batches. This website is partially run by the students who are enrolled currently in the Journalism class. The latest Chronicler and Tambuli news are featured in the website. There are pages devoted to alumni news, marching band news, school current events, discussions, and blogs. www.ahsmultiply.com is similar in content and purpose as www.arellanohigh.com. This website, however, will soon be phased out by the servers. 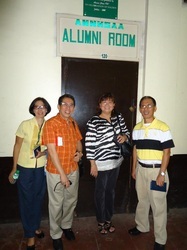 www.arellanohighschoolalumni.weebly.net presents the profiles and inspiring lifestories of accomplished Arellanites. Featured are the stories of outstanding alumni, such as, Lorenzo Sumulong, BenCab, Reynato Puno, Alfredo Santos, Redentor Romero, Thelma Clemente, Luningning Go, Adrian Cristobal, Gerardo Sicat, and others. www.tagalogshortstories.com is a literary website that features short stories, many of which, relate to high school life, challenges in growing up and living in the Philippines; and, in general, about love, faith, respect, honesty and other Filipino values. Then there are websites hosted by the different class batches. Class batches ’54, ’55, ’64, ’68, ’70, ’71, ’80 each has very well-represented and active websites. Searching for information about the Alma Mater, the class batches, the alumni, your classmates? 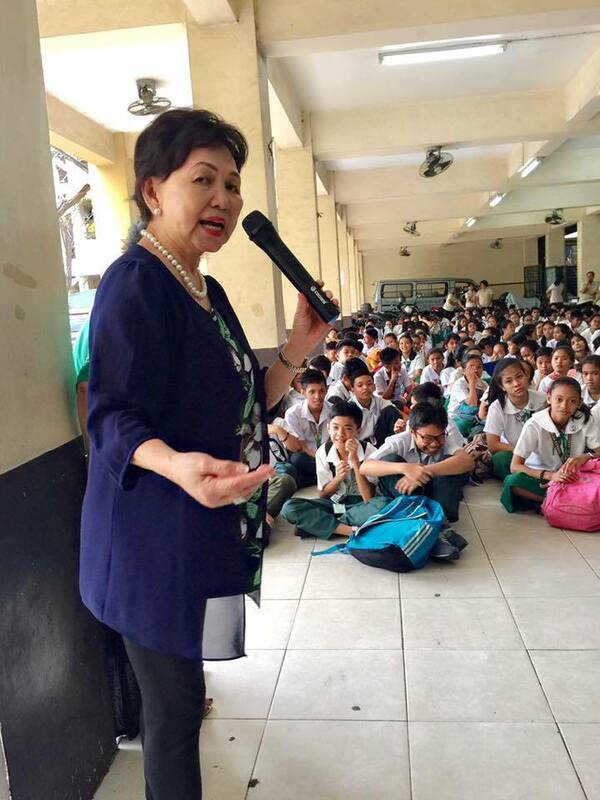 Just google Arellano, Arellano High, Cayetano Arellano High, AHS, Manila North, Arellano alumni. There is a trove of good websites that will pop up. Good luck, hoping you get connected! 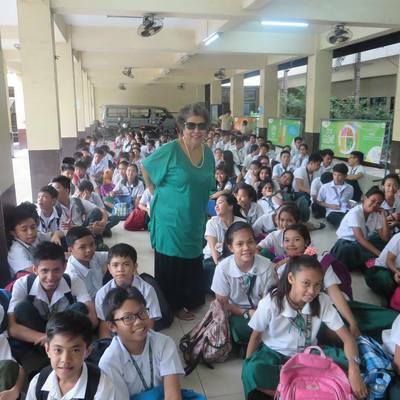 It was an early Christmas gift for the budding writers of Cayetano Arellano High School Journalism. 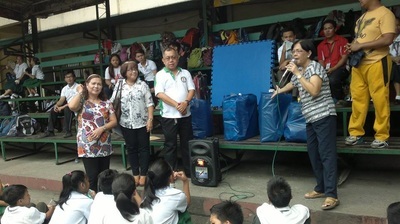 The Cayetano Arellano High School Alumni Fund International (CAHSAFI), through its two Philippine-based directors Ysrael Cunanan and Val Obana,turned over electronic gadgets such as laptops, computers, amplifier/speakers, handycam and digicams, as donations for the use of the Journalism classes of the school during a ceremony held at the principal's office and attended by principal Dr. Loida D. Diaz, Journalism advisers Mr. Mario Arocha and Mr. Joselito Zacarias, Mr. Eric Marcelino, the school property custodian and some staffers from The Chronicler and Ang Tambuli, December 17, 2012. Mr. Cunanan said that it's a part of the advocacy and commitment of the CAHSAFI to extend assistance and support to the school and its students being an organization composed of CAHS alumni. 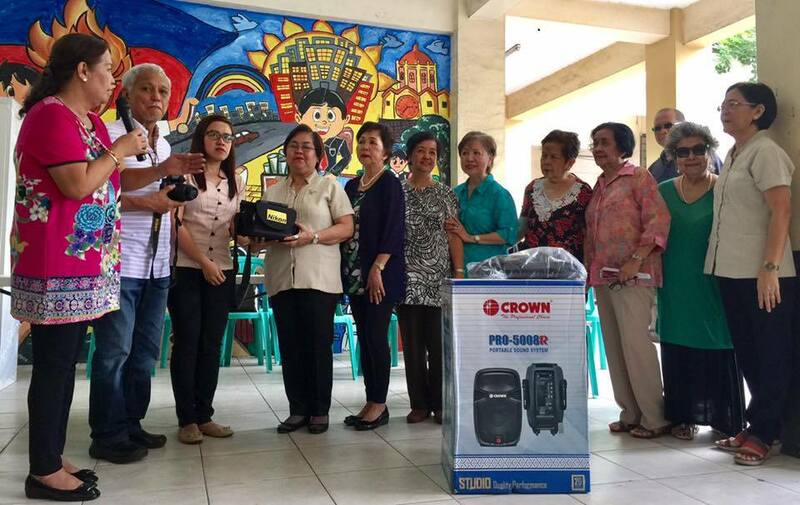 Dr. Diaz was profuse with thanks and told the staffers of the twin papers (Chronicler and Tambuli) to take care of the donated gadgets and use them properly. 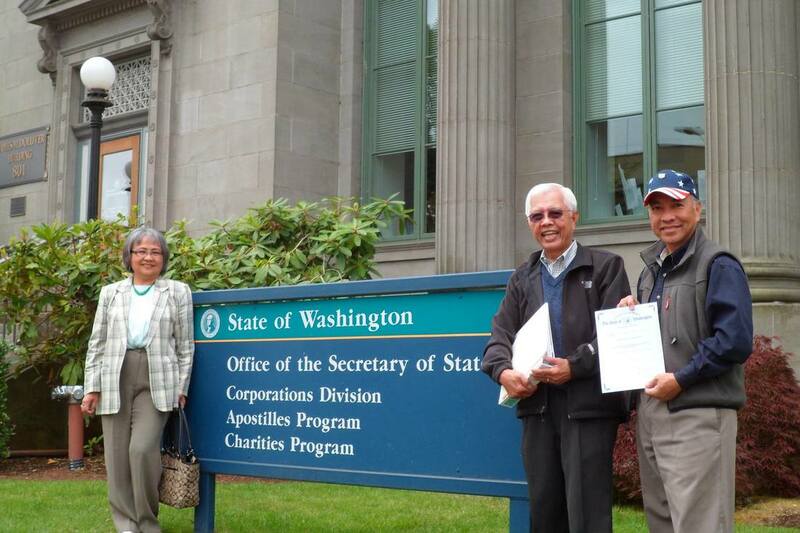 The signing of the deed of donation and photo ops followed. (MARIO AROCHA). Please see more photos in the MORE tab - Pictorials. Esteemed Directors, Nakaugalian ko nang tawagin kami as KKK (Kataastaasan, Kagalanggalang Kasapi ng CAHSAFI). Last Saturday, Oct 13, 2012, we had a Board meeting to act on some of the issues concerning this organization and expanding the Board was one of the items in the agenda. The maximum Board size has been increased from nineteen (19) to twenty-five (25). Seven candidates have been elected to bring the current total to eighteen. First of all, on behalf of the Board of Directors of CAHSAFI, let me thank you for accepting our invitation to join in this noble undertaking and secondly, it is my great privilege and honor to welcome you as the new members of the Board. 7. Rolando Lacanilao, ’71 CA. Yes, they are brothers! I have appointed Corazon to this as we need to have a CPA from Manila to serve as the Asst Treasurer, reporting to our Treasurer here. We are in the process of setting up the Phil entity and we have already set aside part of our money in a Bank account there (Chinabank). I propose to eventually make this a rostered membership organization to keep track of where everyone resides for demographic purposes. All the RP Direk need to be on these as they will eventually come face-to-face with scholarship candidates. All things must be properly fed and cared for in order to thrive and succeed… A nonprofit board is no different. The governance committee ensures the constant health and effectiveness of the full board and the work it performs for the organization. It expands the traditional idea of a nominating committee, clarifying the variety of responsibilities a governance committee truly has. Governance Committee discusses this group's challenging responsibility in overseeing the performance of the board and managing compliance to the organization's mission. This committee can help the board live up to its highest potential, keeping board members energized and engaged in maintaining value and control. The last two are the new Committees brought up at the recent Board Meeting. Please visit our website, www.cahsafi.com to know more about our story. Later, I will be emailing you some more to keep you up to date on things, give you our contact info, including our bank account where you can send in your contributions, and what still needs to be done to lay the groundwork for our first grant as we build up our funds. Know that our intentions are good and our hearts are in the right place.